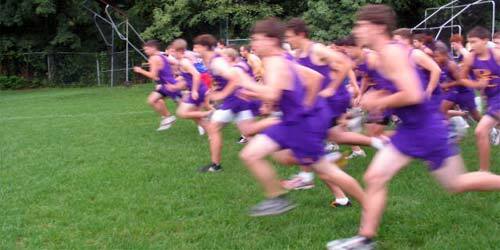 Wanderers Cross Country Race is Another Classic! 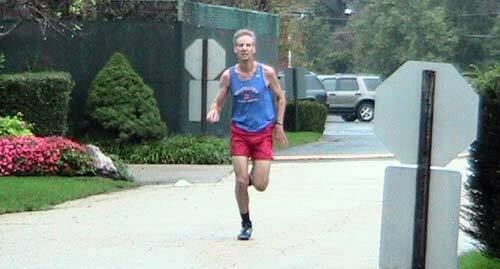 The Chestnut Hill Cross Country Classic bills itself as open to runners of all ages and abilities. And that is exactly who showed up.... a great assortment of veteran cross country runners, newcomers to the distance, young runners, older runners, fast and slow. 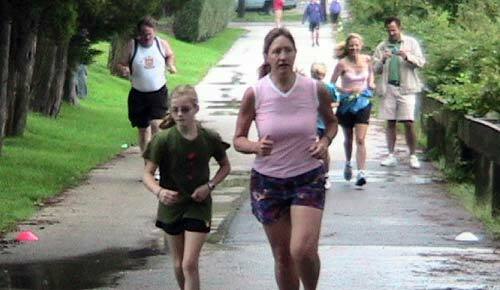 In all, 74 runners competed in the event sponsored by the Wanderers on September 16. 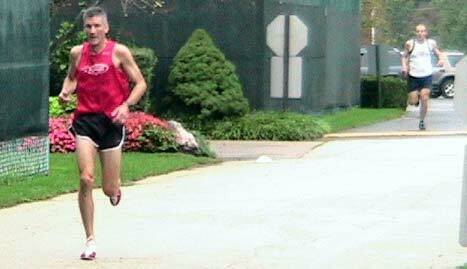 High school assistant coach Joel Alberts won the three-mile race in 16:05 followed by local cross country legends Chuck Shields and Bob Rimkis in 16:37 and 16:53 respectively. The Wanderers own Matt Palombaro finished fourth in 17:04. Leah Whipple was the top women’s finisher in 21:39 followed by Joan Affleck in 22:12 and Alison Myers in 22:54. 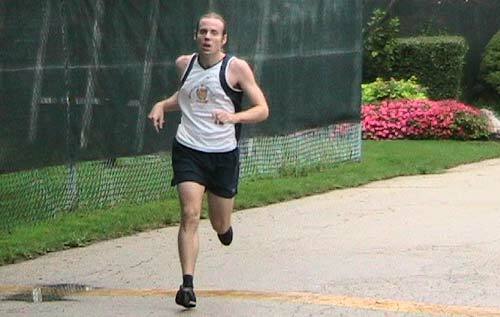 Jim Trainor also represented the Wanderers and finished strong in 32:16. Great jobs were also turned in by Lola and Melanie in registration and organization, and as usual Paul Hines from Chestnut Hill Academy for directing the event. The 5th annual Chestnut Hill Classic was held under cloudy skies but luckily the rain held off. Although not hot, the humid weather made the runners work hard. The winner Joel Alberts sprints for the finish. 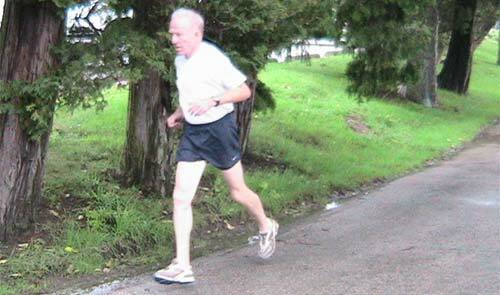 Bruce Gilbert looked strong out on the course. early stages of the race with Jim on their heels. Chuck Shields was his usual powerful self out on the course. Chuck finished second. good early season form finishing third in 16:53. Although Matt was a little disappointed in his time, he still looked awfully strong. 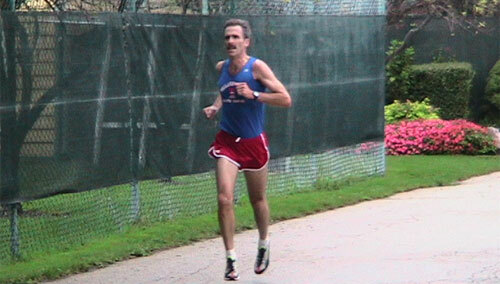 Bob Reynolds finished sixth in 18:04. Leah Whipple was top finisher in the women's division in 21:39. The Wanderers Jim Trainor just kept on truckin'. Great job, Jimbo! 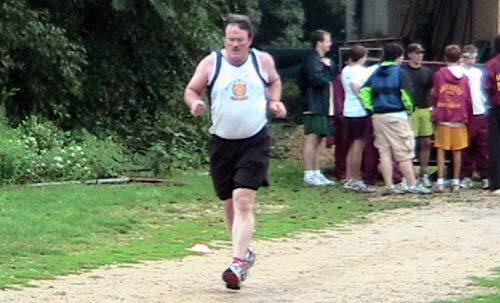 Father Kevin Saint Clair looks strong at the finish too!